Looking for the start time of tonight’s opening ceremonies broadcast for the Olympic Games, I ended up getting my info from LATimes.com. After reading about the spectacle in store tonight, I thought about how stoked the news site must be to land my traffic. And how SEO smart they must be. I wondered what they were doing to be among the top ranked results for those looking for info on the opening ceremonies. And why did I choose that link among those listed? First off, I’m a little surprised that Google didn’t answer my question right on the results page. (In case you’re wondering yourself, NBC at 7:30 PT/ET tonight!) A Knowledge Graph box seems appropriate for the search, no? Perhaps that’s asking too much for such a long-tail query. A search for [London Olympics] returns the graph as expected. Back to the results I got (above), none of them included the info I was looking for in the descriptions Google used. At this point I knew I couldn’t get my answer in a cut-and-dried manner. As my expectation shifted, I added new selection criteria, namely interesting info about the ceremony. The preview provided for the LATimes.com result sells it with mentions of director Danny Boyle and a peek at the headline, “Olympics 2012: What time is London Olympics.” Here it scored points for relevance and piqued my interest with new info. And then I saw that an excerpt in the preview answered my question! I bit. The Knowledge Box Google displays for the query “London Olympics”. I learned that 15,000 performers will feature in the opening ceremony. Paul McCartney will be playing live, and the Queen will officially open the Games. Shakespeare’s “The Tempest” casts a major influence on the show and Isle of Wonder is the ceremony’s theme. This stuff is just cool, amirite?! After reading that article, I clicked more links and was off looking at Olympic posters through the years, images of memorable Olympic moments from TV, and a very helpful guide to London Olympics TV coverage. Turns out there will be more than 5500 hours of Olympics TV coverage on nine different channels this year – an awesome upgrade from just 2000 hours in 2008. This same piece gave me the highlights of some of the Games most exciting storylines. Are you Team Phelps or Team Lochte? This may be this Games’ biggest rivalry. Have you fallen in love with the Flying Squirrel? Prepare to. The LA Times Olympic Games content was an example jumping on a trending topic bandwagon, done right. I’m also enjoying Mashable’s coverage, like the infographic on what Olympics issues are getting the most buzz on social networks, and the 5 essential apps for Olympics fans. And of course the apps themselves are noteworthy examples of effective marketing jumping off a popular topic. 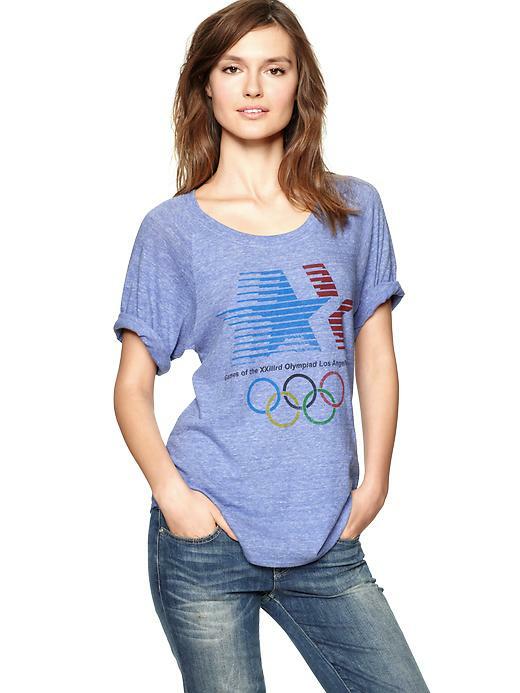 The GAP is selling T-shirts with vintage Olympic logos. Using Olympic logos isn’t allowed for most — of course, having deep pockets helped GAP broker a partnership between brands. Post factual information about events. Have a campaign that encourages sporting excellence. It must not contain any reference to the Olympics in words or pictures. Post enthusiastic, but nonspecific, updates about events. Running a marketing campaign that associates your brand with the Olympics. Encouraging Olympics-themed responses from your community. Using the Olympic symbols, the word “Olympics”, “Paralympics” or any derivation of those words. Posting messages of support to athletes. The London Organising Committee of the Olympic Games (LOGOG) forbids a message like “Brand X supports our team at the Olympics.” Take caution. Tonight we kick/vault/shoot into these golden weeks of Summer 2012. The whole world anxiously anticipates the victories, rivalries and personal triumphs about to play out. With search smarts, creative content marketing and cautious branding, marketers can tap into the electrifying energy and get in on the Games.